It´s number 35th of what you know. Box-Office number here in Portugal. And yes, we have a new number one, after two weeks at the top from "Ice Age:The Meltdown". Let´s just say it´s from a ver influential filmaker. And that about does answer the question. If you didn´t you will know in a while, just continue reading. And after six weeks going up, we have a week going down, 12% to be exact. The top ten films managed 347890 spectators. A strong week, but according to ICAM, the cinema is in a bad state with the last three months loosing 10% of it´s audience last year. And that was already a bad year. Dire times indeed for cinema all around the world. And the influential filmaker is Spike Lee. Ofcourse, guessing the movie is now easy, since it´s the only Lee movie that actually made some kind of money. The man deserves it, also. 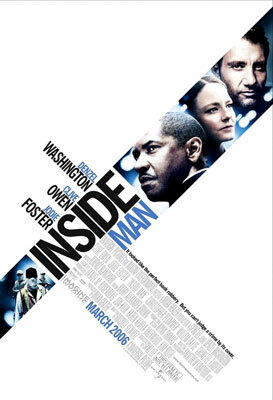 It´s "Inside Man" with 90697 spectators. A very strong opening, in the thriller market. The strong cast, filmaker and story made it a sucess that is entirely deserved. Bring it on again Mr.Lee, comercial or not we see it. At number 6 we find a player that underplayed more than i expected, "Date Movie". With only 26264 spectators this are bad news for the stupid going people market. It´s doesn´t get it here in Portugal. The only exception is "Scary Movie" as we will see next week. I´ll just run far away from theathers that exibit this films. Far Far away. "Hostel", the groos out horror fest of the week gets neglected by the audiences. And we are talking horror, a genre very appreciated in this parts. Even the Tarantino didn´t help it sell. And Slovakia isn´t happy about it. I wonder if it will open there. That would be ironic. It got 16834 spectators. Very weak indeed. At number 15 the last opener is "The Ice Harvest" with 1523 spectators. As i said, this would go pas under the audience radar and the numbers prove it. It could be the best film of the world and it wouldn´t stand a chance in the market onslaught. Will disapear very rapidly of our theathers and minds. - The other ones don´t stand a chance and they are "Lisboetas", "Lie with Me" and "Keeping Mum"
E está a ter sucesso, estou a ver :).